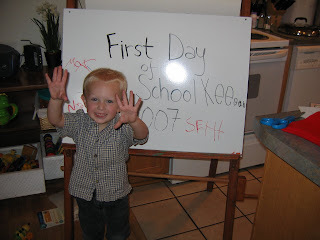 Noah started Joy School today and it was very exciting. There are three other boys Keegen, Max, and Seth. Today he played with the kids, and had sharing time (he showed his Mack with eyes), He learned the song "where is thumbkin" and played outside. He says it was lots of fun. Mom says he was a pill. But all in all it went well. Depending on what you wanted to do. Centering the picture and putting the words underneath is accomplished by choosing the "no layout" option when you upload the photo. I have yet to figure out how to change the setting once you have uploaded the picture. To delete the post you'll need to go to the dashboard. It's easiest to find by choosing to make a new post and then looking at the links in the top right corner. Click on Dashboard. Then you'll see a list of all of the posts, the ones you've made will have the option to delete them in the right most column.